We have been working on Wow! 2 in the last months capitalizing the know-how achieved developing plug-ins like Shape and others. We set out to develop this new outstanding tool by improving performance and all existing features and adding more features to improve user experience and speed up the workflow. We invested a lot of resources in the user interface and all functions are now customizable. A new exciting exclusive core feature of Wow!. It magically improves edges and overall tone, protecting highlights and shadows. It allows pushing the frequency sliders further. You can now adapt the frequency range to the file size by choosing Low (up to 16MP), Medium (16 to 32 MP) and Large (32MP onward). A custom frequency button is also available. An alternate tool to protect highlights and shadows working by creating a layer mask. It works differently from Tone Preserving. You can easily compare both options by using the “New” button. “Quick” is a single frequency two-layers decomposition for a quick final retouch after the application with sliders. The value of the radius affects the kind of detail you will get. With the default “Luminosity” engine, you can now fully control the saturation. 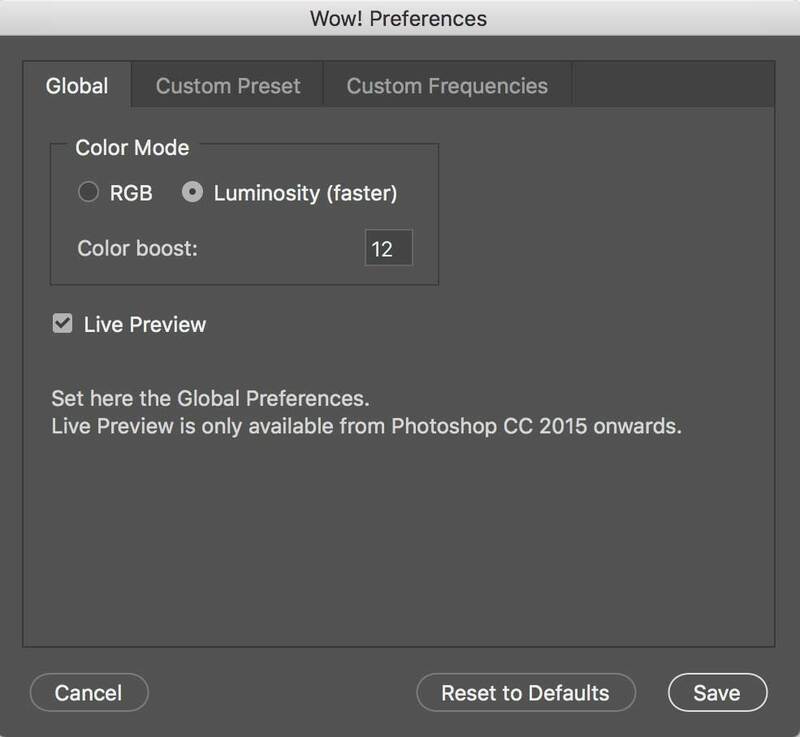 This setting is independent of presets. As an alternative, you can use the “RGB” engine. We added many functions to improve the user experience. Among them tooltips help when mousing over, a “New” button to create and compare versions and full layer naming. The straight application of the preset “Beauty”. The model’s skin is smoother and brighter, almost glowing. Her hair seems to have been brushed. Her eyes have more depth, just like the lips. The image no longer seems slightly out of focus, and the colors are warmer and more vivid. Mouse over the image back&forth to see the before/after. No, she didn’t fix her lipstick! It was Wow! + Edge & Tone Preserving, the new exciting exclusive core feature of Wow! Frequency Equalizer that magically improves edges and overall tone, protecting highlights and shadows. It allows pushing the frequency sliders further. Mouse over the image to see the before/after. This booklet is designed to easily compare versions going back and forth through the pages using the keyboard arrow keys. “View in Full-Screen Mode”. We suggest going back and forth several times in order to watch even smaller details. Top to bottom: the new Quick Preset buttons including a customizable one. The Frequency and Opacity sliders. The new exclusive Edge and Tone Preserving. 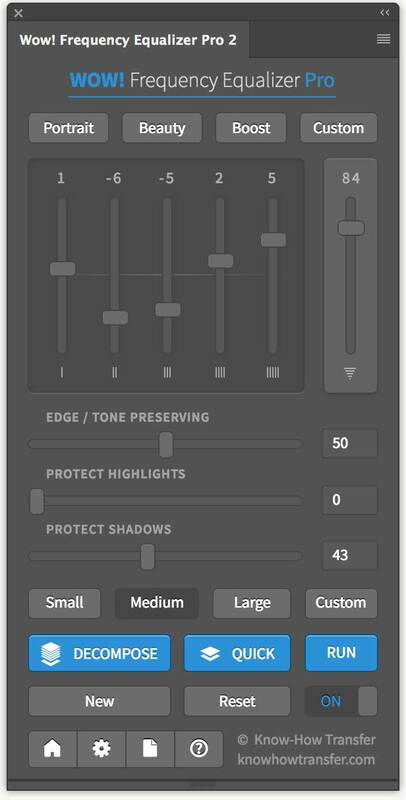 The new Protect Highlights and Shadow cursors working by creating a layer mask. The new Frequency Buttons for adapt the frequency range to the file size, including a customizable one for advanced users. The Decompose Button (Wow! Pro 2 only). 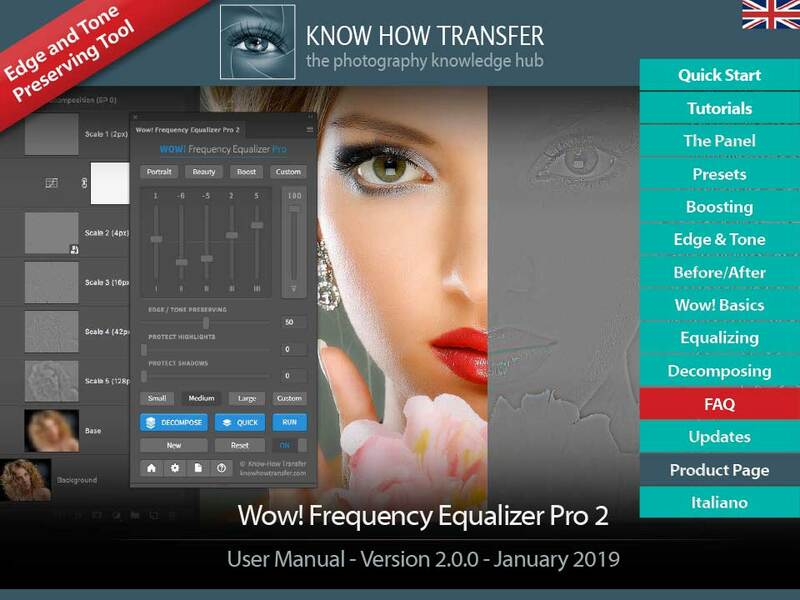 Now it’s possible to decompose the original, the image tuned with sliders or by creating custom frequency values for special effects or retouch. The new Quick Decompose button. A single-frequency two layers decomposition for a quick final retouch after the application with sliders. The “New” button to create a new version instead of replacing the previous one. Last the classic footer buttons as other plugins. The preferences tab is now very performing allowing to customize general settings, custom presets and custom frequencies. Go to your My Account Page and log in using your username or email. If you don’t remember the password, use recovery service. Once added the product (Wow! Pro 2 or Wow! 2, no bundles) to the basket it will already be at the discounted price. Add the product to the basket, go to cart, and the price will be displayed at the full price. Proceed to the next page where you will be asked if you are a new or returning customer. Select “Returning ” and the price will switch to the discounted one. Did you purchased Wow! 1, Wow! Pro 1 or the Wow! Pro Bundle from December 1 onward? You are eligible for a free upgrade. We warmly suggest considering to buy our convenient bundle of Wow! 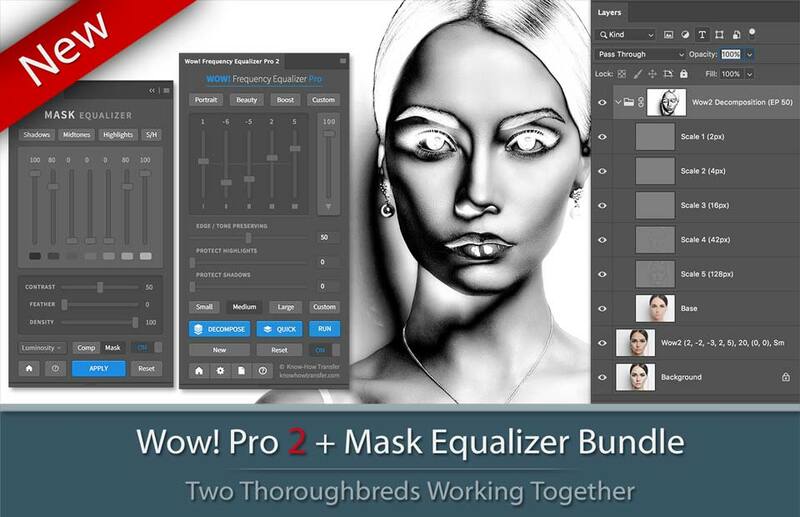 pro and Mask Equalizer. This plug-in that creates sophisticated luminosity masks with one click, is entirely independent of Wow!, but it shines when they are used together. It also works with adjustment layers, advanced objects, and groups. Lenscraft is led by Robin Whalley, a UK based Landscape Photographer and Author of over 20 books on Photography and photo editing. Below all the links.